They look so innocent . . . There are a couple of dozen varieties of Girl Scout cookies at most, all of which are beloved by somebody, usually a lot of somebodies. You probably know the drill — the cookies are delicious, the salespeople are adorable (and often the daughters of coworkers or, worse yet, bosses), and the whole process is good for girls because it funds their activities and teaches them business skills. Girl Scout cookies are also the reason we, in my family, decided that we would merely test the paleo diet, rather than simply embracing it. The best way to switch over is to simply toss out all the food which doesn’t fit and start from scratch. We had cookies on order and they are just too delectable to reject like that, so we knew from Day One that paleo would just be an experiment until those cookies came and went. For me, it’s the Thin Mints which are my weakness — eaten frozen with a cold glass of milk. In my younger days, I could put away one of those cello-wrapped stacks without even feeling any bloat. Now, though, they are just the kind of engineered overstimulation which leads me to seek out a diet which respects my body rather than treating it like a junk food processing plant. Now I’m not one to weigh myself, but after a week of eating paleo and hearing positive reports from my spouse, I tried to get into the habit. I was quite surprised by the first number, which was a good dozen pounds higher than I expected. A couple of days later and I had lost more than a pound, so I know the eating plan was having some effect. Then, the cookies. I knew I wasn’t alone in eating them, but I also knew that they were my only chance to finish up the close to a gallon of milk we’d had to freeze lest it sour out of abandonment. The cookies arrived Sunday, the milk was thawed by Tuesday, and by Thursday I had packed away probably a full box myself, and the rest of that milk. First, the quantifiable: I picked up two pounds just by giving up on avoiding the “bad foods” for a few days. Wow. Maybe it’s because I am not in the habit of weighing myself, but I’m really surprised at how quickly those numbers on the scale can jump up and down. No wonder people get obsessed about their size. But the changes have been more than the merely measurable. I’m more aware of my body now, simply by spending a couple of weeks being conscious of my food choices. And with that awareness, I feel pretty gross after spending a few days going back to eating crap like cookies, pizza, and MSG-laden treats. I like that I’m finding that a binge like this makes me feel disgusting. It tells me that my body has had a taste of something it likes better, and it would like more of that, please. There are cookies left, but I think I’ve had enough of them, thank you. For the most part I don’t participate in Pagan community controversies, but Z Budapest set off another firestorm by threatening to hex people who interject males into her Goddess chant, and I felt moved to weigh in. I’m not her friend on Facebook, so instead of joining the slugfest there I sent her a private message. I have read your request regarding the goddess chant you wrote, and all of the many, many comments it generated. I myself was introduced via Robert Gass and On Wings of Song, and until this day did not know that you were its author. Truly, it is a lovely chant, and I have never heard an attempt to “balance” it that really worked. The chant it about the Goddess, and I don’t believe there will ever be masculinized lyrics which will ring with the same truth. As a genetic male, one whose understanding of female experience is limited by that fact, I will respect your wishes. It has nothing to do with copyright, and little to do with your hex; rather, I honor the pain you have endured from other males, and will make no effort which will compound it. I now understand that introducing masculine elements into this chant, which you undoubtedly crafted out of love, is to cause such pain. I wish healing for you, and all victims of oppression and violence. I will discourage people who introduce such masculinity into this chant to stop. In my mind, that includes not only male imagery, but male participants in the chant. I did not understand your vision to keep this chant for women, but now that I do, I shall respect it. I wholeheartedly support your right to walk a path from which I am excluded. Self-segregation is entirely appropriate; it’s only segregation and subjugation by force which must be opposed at all costs. The angry comments all seem to stem from people who either A) want the right to self-segregate or B) believe that all forms of segregation must be abolished. Both factions no doubt feel attacked and maligned. I pray for healing in the Pagan community. May your personal path to healing face no further stumbling blocks. I am truly sorry that you need to walk a path which is distinctly separate from that of men, but I will respect it. I feel terrible that there’s so much hate in the world, and that it compounds upon itself as cruelty turns to revenge and retaliation. Blacks hating whites, women hating men . . . all at least partially justified, but all feeding the fires of anger and violence. It’s not my place to fight fire with fire, and I certainly don’t have the tools to quench this blaze. There really is value in going it alone, and I sincerely hope that Z and her followers find peace, not war, by taking that path. 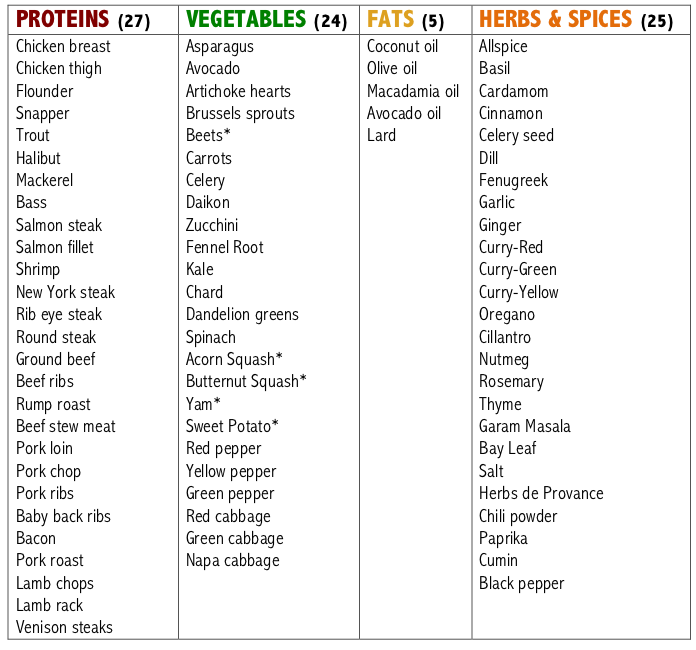 Pick one from each column to make a paleo meal. Actually, that’s just the nutshell of what she gave me, which can be downloaded as a pdf here. It’s four pages, because the diet creator Robb Wolf tends to use ten words will one will do. The crux of the document is that the paleo diet isn’t boring — just pick a meat, brown it in the fat, add a vegatable and spice, and voila! A new recipe every time! Of course, that’s only true if you think that one stir-fry isn’t just like the others. I do. I hadn’t realized that there was a concern about this diet being boring until I read that, and now I understand why! This is the crux of the truth that I can’t get paleo followers to admit — if you’re committed to this diet, it will cost more money to put food on your table, particularly if you don’t want to eat yet another stir fry every day. When I have tried to ask direct questions about cost, I get formulas to compare cost per calorie, or a philosophical discussion about the cost of problems like diabetes, which this diet should help me avoid. The problem with selling me on the long-range benefits is that I still have to spend money on food now, and I still have to enjoy eating food now, because my relationship with food and money are both complex. I don’t always eat when I’m hungry, and I don’t always have more money to spend now, even if it means saving money later. I consider this shortcomings even as I watch my wife’s weight plummet — just a week in and she’s dropped more than a pound a day. More money on food, and a more tedious variety, are almost certainly worth it for a happier, healthier spouse — but I wish people would just give me straight information rather than a sales pitch. I do not understand why more men haven’t tried the paleo diet. I know quite a few ladies who have checked it out, but you’d think that a diet designed to eat like a caveman would be appealing to more guys. My household (two men, one woman) has decided to test out caveman cookin’. We’re trying out some of the recipes and seeing if we can stomach the stuff. The diet is based on only eating the kinds of things humans ate after they mastered fire but before agriculture, more or less. Lots of fruits, vegetables, meats, and nuts. Avoid carbohydrates like grains, rice, and beans, as well as added sugar and chemical-rich convenience crap. Giving up bread is gonna be tough, but I’ve never been a lover of rice and beans. I can adapt to more bacon and eggs pretty easily, but I will sorely miss the peanut butter. I’m sure the paleo diet has many benefits, but the one I have noticed after only a few days of dabbling is that it, like any diet, gets me thinking about food. Right consciousness, meet snacking. If I have to consider each piece of food, I have to think about whether or not I’m hungry. That, in turn, makes me more aware of my body. How its shape has changed. How parts of it now move in independent ways. It gives me an interest in changing my habits, and changing my body. Why any guy wouldn’t want to eat like a caveman is beyond me.